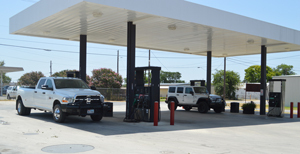 For over 83 years, McBryde Oil Company has supplied the highest quality gasoline products and services to residents and commercial businesses throughout Central Texas. We are committed to providing our customers with friendly, personalized service and a dependable supply of gas to keep them moving forward. Our gasoline products meet the most demanding standards in the industry, designed to meet every type of driving condition. We sell all three octane grades with flexible delivery options that best suits your unique needs. With our unmatched fleet of transportation trucks, we are capable of delivering large quantities to your site – safely, on time and within budget. Whether used for your retail business or construction facility, McBryde Oil Company has the gas solution that meets your specifications. To find out how we can help your operations run more efficiently with our quality Kerrville Texas gas supplier services, call us today at (830) 257-6577!